The apartment is fully equipped and furnished and with free WIFI. It has 1 bedroom with wardrobe and comfortable double bed, 1 bedroom with bunk beds 2 (bottom is the indiv. And removable) with wardrobe, living room with sofa bed (single bed has or form a double bed), 2 bathrooms (1 full and 1 c / Shower), balcony with table, 4 chairs and panoramic views of sea and countryside, well equipped spacious kitchen. 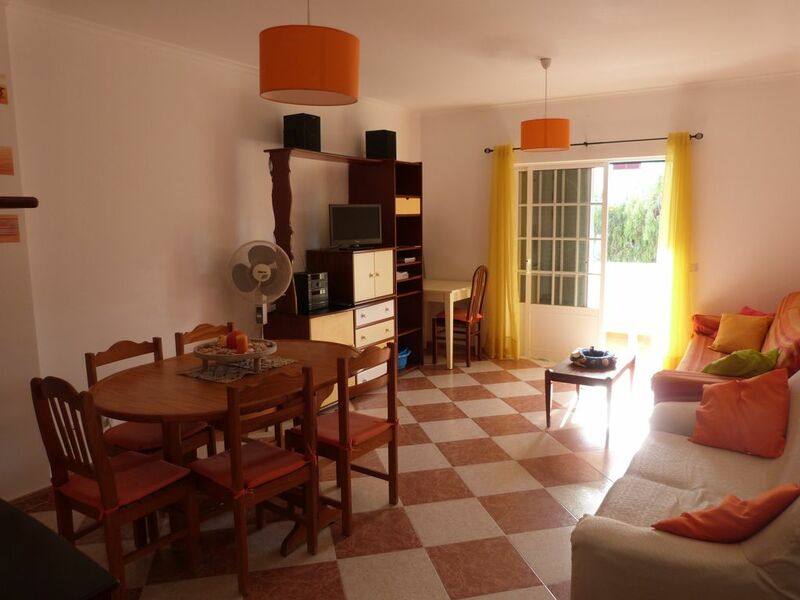 Situated in a quiet location but close to everything, beach, village center, restaurants, skate park, local shops, etc. Height is a fishing village tradition and urbanization, recent, consists mainly of villas. Except for the hotel, the construction is low, at most has 4 floors, in the urbanization which includes the apartment, there are villas and 3-storey buildings. The village has various restaurants, supermarket, mini markets, traditional market (aka square) where you get fresh fish, some locally caught, fresh vegetables and fruits, and even several local grocery shops. It also has terraces, playgrounds (skate) and children's Municipal Pool or play park on the beach. Very quiet, is close to the field, easily reaches a Algarve Monte, a golf course or to Spain (10 km by 22 The toll free). It is relatively small, pleasant to navigate on foot. For those who want more night life, is close to Monte Gordo or Manta Rota there are numerous bars, nightclubs, casino, etc. The beach with a sea without large waves usually allows rest in peace, even with children, because the beach extends for several kms and usually form small pools where they love to play until the water temperature (in summer is around 20 ° C). Served with water sports, jet skiing, banana, kayaques, water bikes, school Kitesurf, allows it to be in business if desired. At the end of August do not miss the Medieval Feast of Castro Marim. during your stay visit, if possible, the 'Pego do Inferno' near Tavira, where in the middle of vegetation is a place with natural waterfalls or the beach Barril in Tavira which can be reached either by walking or by a train own. Vila Real de Santo António, with its Pombal architecture and the area of ​​'marshland', protected area, is also a place (9/10 km), to visit. Bicycle tours, which can also be rent in the village will be somewhat nice. Walking the beach to Manta Rota or to Green Beach or Monte Gordo, are a healthy way to spend your time. On the way you can catch bivalves, 'cadelinhas', which exist in abundance, buried in the sand at low beach (low tide) and then enjoy this 'snack' gastronomic. 1. Заменить 2 (две) кровати, которые предназначены для детей на кровати для взрослых. 2. Заменить диван - у него истёк срок службы. 3. Перед заездом гостей необходимо устанавливать заполненный газовый баллон, чтобы не тратить время на его замену и покупку нового баллона. 4. Нужно проверять исправность работы газовой плиты до приезда гостей, чтобы не было неприятностей. 5. Необходимо отремонтировать или заменить холодильник - он очень громко работает и мешает отдыхать ночью. Een leuk en rustig gelegen appartement met alles er op en er in. Het was een appartement van 13 in een dozijn, maar de ligging aan het eind met een balcon waar je de hele dag zon hebt en de zee op loop afstand. Er is alles in het huis aanwezig om te koken en te bakken en braden. De elektrische BBQ hebben we niet gebruikt. Er zijn borden en bestek voor 20 personen en als je wilt kunnen er 6 volwassen mensen of 4 + 4 als er kinderen bij zijn. Carlos is een vriendelijke huisbaas die alles geduldig uitlegt. Apartamento muito limpo, com divisões com boas áreas. Apesar de muito calor no exterior, o apartamento é fresco e arejado. Muito perto da praia, cerca de 5 -10 minutos a pé com crianças. Zona muito sossegada, indicada para famílias com crianças pequenas. Apartamento espaçoso, limpo e arejado! A garagem sendo comum não permite o estacionamento de um automóvel familiar, devido á ocupação excessiva de tralha pelos condóminos. O nosso carro com apoio ao estacionamento ficou 60cm fora da zona de parqueamento, por este motivo o anuncio não devia referir a existência de garagem. Zona envolvente bastante sossegada e perto da praia o que permite ir a pé. Comércio local diminuto, e diversão noturna quase nula. No geral foi uma semana bem passada, que poderemos vir a repetir. Obrigado pelo seu comentário e fico triste que não tenha sido uma estadia 5 estrelas. Na realidade Altura é uma vila muito pacata sem grande alarido noturno o que a torna única no Algarve. Quem pretende vida noturna tem bem perto Monte Gordo ou Manta Rota ou os Bares da Praia Verde. Ficamos com uma impressão bastante positiva deste apartamento. Começamos por ser bastante bem recebidos pelo Sr. Carlos, que nos colocou à vontade, fez-nos uma apresentação do apartamento e ainda nos brindou com um lanche. O apartamento em si, está bem equipado, permitindo uma boa estadia, como se em nossa casa estivesse-mos. Localiza-se numa zona bastante calma, está próximo da praia e de outros pontos de interesse desta zona do Algarve. Por tudo o exposto será um local de estadia, a ter em conta, para quem queira, passar algum tempo nesta zona. Por último convêm lembrar que o Algarve não é só sol e praia, podendo-se ter umas boas férias, sem que estes requisitos estejam reunidos, é tudo uma questão de espírito pela aventura e descoberta, não é por nada, que a serra está ali tão perto e, também têm bastante para se ver e caminhar, para quem queira sair da rotina. Como sempre, tenho um gosto especial em receber pessoas no meu apartamento, que gostam da zona de Altura. Na realidade, tal como disse, o Algarve não é só Sol e Praia, há muito mais para ver e para fazer e particularmente nesta zona que é servida por campo de golf, zona de observação de aves, montanha, etc. Height is a fishing village tradition and urbanization, recent, consists mainly of villas. Except for the hotel, the construction is low, at most has 4 floors. In late August do not miss the Medieval Feast of Castro Marim. during your stay visit, if possible, the 'Pego do Inferno' near Tavira, where in the middle of vegetation is a place with natural waterfalls or the beach Barril in Tavira which can be reached either by walking or by a train own.